Active regions image of October 14 - SolarChat! As the Sun moves into the southern hemisphere my time for solar imaging reduces to the week ends only due to office work. Saturday morning I taken few pictures of the disc and the two modest active regions now visible. 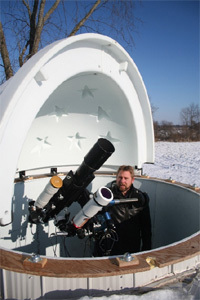 Equipment as usual, my 150 mm achromat reduced to 104 (in Lunt-mod configuration) and to 80 mm (calcium imaging). Seeing was far than optimal, thanks for looking. Really nice images from the Milano sky, Raf. These are lovely images Raf!